Welcome to Down On The Street, where we admire old vehicles found parked on the streets of the Island That Rust Forgot: Alameda, California. Here's a car you don't see on the street every day! When you hang around the 24 Hours Of LeMons staff for a while, you realize that they're all a bunch of Alfa Romeo lunatics. GTVs, Spiders, and even the most awesome Alfa wagon ever. 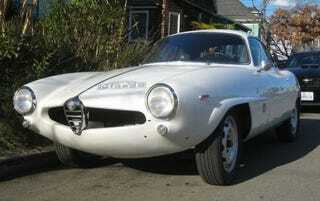 This particular Alfa is owned by Jeff, LeMons logistics expert and creator of the famed LeMons trophies. He was on the island last week, so I took advantage of the opportunity to shoot his daily driver. Yes, he uses an all-original black-plate '65 Giulia SS as his daily driver! It's quite solid, though most of a new front right fender had to be fabricated on an English wheel, and there's the small matter of the just-about-unobtainable windshield.